2X Ultra Bright White 3-LED Fog DRL Daytime Running Light Bar w/Mounting Bracket for Nissan Micra Active XL ICC WT20 SEÂ (Petrol)@1199 Rs [Mrp:-1199] - Onlinedeals.discount - A leading product discovery website. Find the true prices of products, read reviews and buy top brand products at reasonable prices. Full aluminum housing for greatest cooling.Waterproof, Dustproof, Weatherproof, Shock-resistant.Easy for installation. Each light housing equips with 3 high power LED light. HID super White color, long lasting life.Low power consumption, quick instant start-up time.Anti-collision, anti-dust and splash-proof.No pollution, no noise, no electronic interference, more efficient.Enhance overall appearance with extra cool white beam with modern European style.Greatly improves reaction time of oncoming motorists in an incident.The daytime running light improves safety while driving allows your vehicle to be seen at much further distances.Easy to install, connect the positive and negative wires to any of your vehicle power outlet, it comes with adjustable bracket. 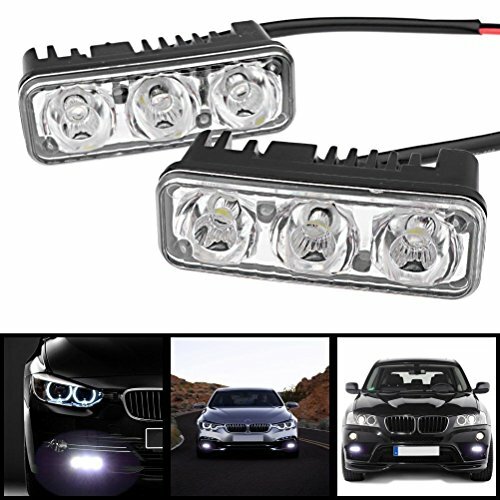 It is perfect for add-on decoration and usage as Daytime Running / Driving Light lamp (DRL),Fog Light, Under Bumper / Grille / Kit Light.